Levels of truancy, smoking and drinking among secondary school pupils are increasing, a leaked report says. According to a Youth Justice Board (YJB) survey obtained by The Independent newspaper, 26% said they had "bunked off" for a day, up from 22% last year. Two-thirds of pupils said they had drunk alcohol, compared with 43% just two years ago. The study, of 4,715 young people in England and Wales, also shows 25% have smoked - up from 21% in 2002. The findings come despite initiatives including prison for parents whose children regularly truant. They can also be ordered to attend parenting lessons or pay £100 fines. The YJB refused to comment on the leaked report, compiled by Mori, which is not due to be published until 19 July. According to the leaked data, 26% of youngsters said they had committed a criminal offence during the previous 12 months, the same as during the previous three years. At the annual conference of the National Association of Head Teachers last month, general secretary David Hart said too many parents "condone" truancy. Many young people lacked "good parental role models" and by colluding in truancy "condemn their children to a life of crime", he added. But Margaret Morrissey, spokeswoman for the National Confederation of Parent Teacher Associations, said: "It is disappointing hear a head teachers' union making negative attacks on parents and parenting skills." 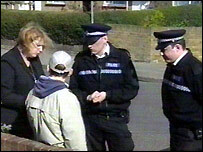 Several parents have received prison sentences during the past year under the government's scheme. A Department for Education and Skills spokesman said: "Our balanced approach between support and sanctions for parents of persistent truants is delivering positive results. "Since last year, the equivalent of an entire secondary school is back in school each day, every day, and secondary school attendance rates overall have improved since last year in 133 of the 150 local education authorities."